Chewy, crunchy, creamy and fresh. This salad is bang on. It’s what I like to eat on hot summer evenings. The bottle of pinot gris wasn’t chilled enough to accompany this dinner salad, but I can only imagine it would have been a nice pairing. Earlier this week, I had a box of blueberries delivered to my door (thanks so much BC Blueberries!). 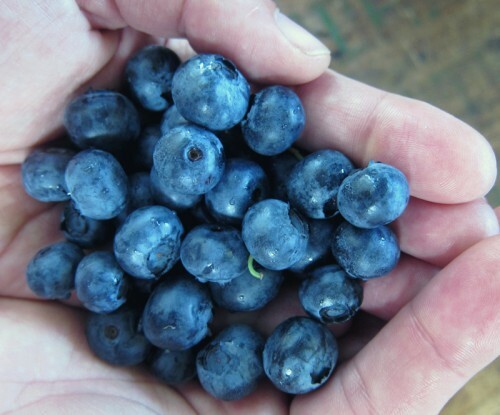 British Columbia grows about 95% of Canada’s blueberries and they’re having a bumper crop this year. I checked at my local market and found local BC berries selling for $1.99/lb! We’ve been snacking on them in the raw, adding them into our granola & yogurt and they make a fine topping to french toast dripping with maple syrup on a Saturday morning. I have plans on trying a blueberry shortcake and this version over at Lotte & Doof sounds pretty wonderful. But in the meantime, there’s this salad. I loved this salad a whole lot. When I woke up this morning, I had the leftovers for breakfast. I’m a bit bummed to admit that Cornelius wasn’t as enamoured about this salad as I was. He doesn’t like brown rice or wild rice and this salad has both. However, he loves blueberries and I thought because of all the textures and flavours it was something he’d get over, but nope. More salad for me then. The photo below? My breakfast bowl. With blue cheese crumbled over top. That’s apparently how I roll at 10 am. I think this salad is pretty perfect as is. Yet, I’m always in favour of using what you have. Got ripe & juicy cherries? Add those in place of blueberries! Dried sour cherries too spendy? Substitute some chopped dried apricots instead! Pecans instead of almonds? Go for it! In a medium sized pot, cook the rice according to package directions. When done, remove from heat and set aside. In a large salad bowl, combine the celery, green onions, red pepper together with the warm rice and toss well. Using a jar with a lid, mix together the dressing ingredients and shake well. Taste & adjust seasoning if necessary. Pour over the salad and add in the parsley, dried cherries and almonds, tossing until well mixed. 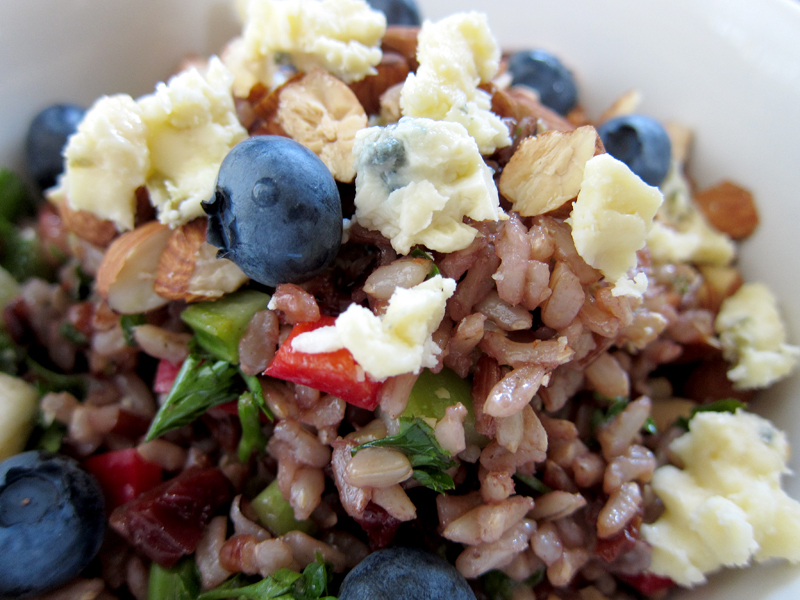 Serve with fresh blueberries and if using, blue cheese crumbled over top. I love how there’s a good mix of sweet and savory in this! Plus it’s just so pretty. This salad sounds absolutely perfect! 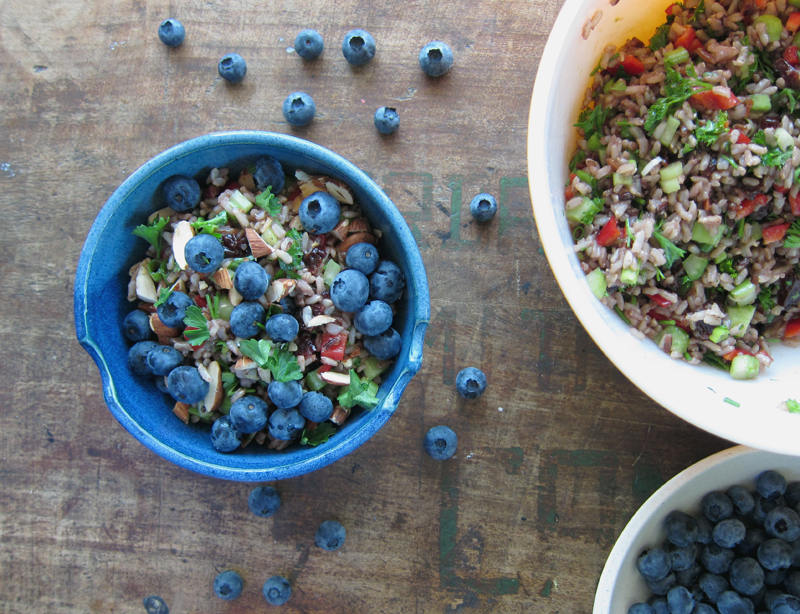 Everything I want in a salad is in here…plus blueberries! Yum! I envy you your fresh blueberries so good in everything from salad to breakfast. No blueberries where I live. It’s mango season here. 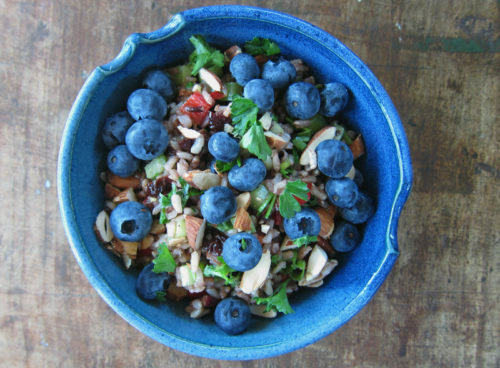 I love the idea of throwing some blueberries in a rice salad. Sounds like the perfect way to an a summer evening. These photos! I love how the blue just pops! I’m bummed when I get really excited about a recipe and Marc is kind of eh about it. But you’re right, more for us! I love all of the flavors and textures in this salad and the addition of bleu cheese? YEP! Katrina, thanks! It’s a keeper. Wizzy, I wish I liked mangos! Though I’m sure plenty of people would love to be in your position!! Yes, Kasey, it’s a great quick meal to throw together. Summer dish FTW. Thanks Nicole, the blues are so pretty – you don’t have to do a thing to them. And yes to the cheese!! Glad I’m not alone on the recipe front between partners. Sigh. jeannette! dang, this salad looks great! healthy summer and blueberry harvest mania. love it and definitely going to try it! chewy crunchy creamy fresh are my keywords!! What a beautiful composition! 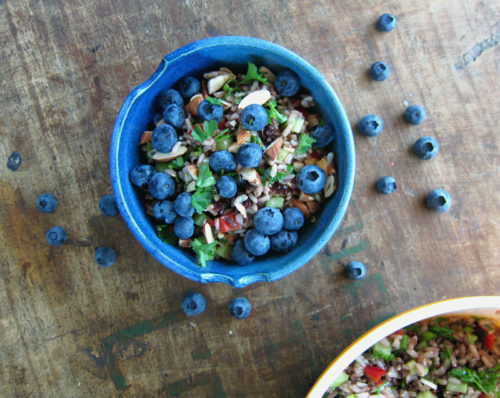 I love this shade of blue from the bowl and the berries and this salad sounds so wonderful too. I’ve never thought to add fresh blueberries to a rice dish or a salad before, but why not? Did I mention how fortunate you are to have local blueberries at your reach? My question is why I can’t find any in TO? It’s so frustrating, isn’t it Caz when our partners like different things! At least you’ve got brown rice to share. I love the blue too, Joanne. BC grows almost all of Canada’s blueberries & I hope you can find some. But Michigan is awfully close & they’d go through much less travel time than BC ones. kickpleat, I bought some local blueberries on Saturday at the Farmer’s market…$6 for 1/2 pint! Are they that pricey in B.C.? Joanne, they’re really cheap here – because they’re local. Last time I looked they were around .99/lb. They have to travel far to Toronto, hence the added cost. Boo! This salad is soooo good – nice and hearty for lunches or to serve with grilled meat. I had to make a few substitutions for what I had (no celery, red and yellow bell pepper, and lemon instead of lime). I couldn’t stop eating it! Thanks for the great recipe. Caterina, so glad you liked this one. I’m glad the lime juice was a good swap. Yum! This sounds great! I am allergic to mustard, though, and I’m always bummed that my vinaigrettes lack depth … I wonder if you know of any good substitutes? Sara, the dijon helps to give most vinaigrettes body as well as flavour. You could try nutritional yeast (I use it to make a great dressing here: http://everybodylikessandwiches.com/2012/06/glorious-bowl/) as it does have it’s own unique flavour. I’d also suggest instead of just using one vinegar or just lemon juice in a vinaigrette, try a mix of lemon juice, cider vinegar or wine vinegar – pick 2! Good luck! Delicious, I substituted goat cheese for the blue and it was yummy! Yay, I think feta or goat cheese would be wonderful here too, Marie. So glad you made & enjoyed this one!